In his article “Yoruba Traditional Education System: A Veritable Tool for Salvaging the Crisis Laden System in Nigeria,” (Journal of Interdisciplinary Studies 2.6), Ayanleke R. Akinwande stated that before the advent of Europeans, character training was an important part of the traditional educational system developed by the Yoruba of southwestern Nigeria. Ifa, the Yoruba god of wisdom, played an important role in this training. 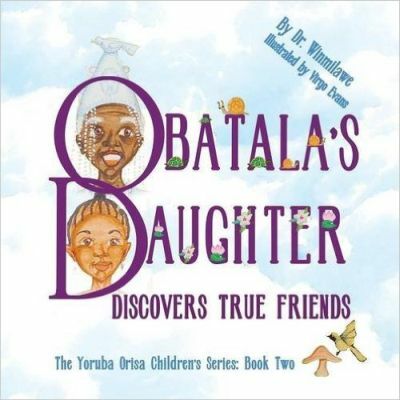 Obatala’s Daughter Discovers True Friends taps into this ancient way of transmitting knowledge to people and making them successful in life. Using a folk story based on Ọbàtálá, the Yoruba god of creation, the 28-page picture book tells the story of Kẹ́mi, Ọbàtálá’s daughter who disobeyed her father’s warning, suffered due to her disobedience, but realized her mistake, retraced her steps and apologized. The story highlights the Yoruba concept of supernatural forces and impact on parents and children. The purpose is twofold: to show the traditional approaches that the Yoruba use to inculcate right character or discipline in their children and show the implication of ignoring parents’ warnings. The plot follows the common themes of Ifá literary corpus –incident, consequence, and closure, and it showcases the Yoruba technique of guiding children to live a normal life. Telling the story to children or adults will help them draw moral lessons from the experience of Kẹ́mi, the main character, around whom a big moral issue revolved. Ọ̀bàtálá, the king, characterized by his white clothing, transparent character, and humbleness, consulted Ifá to know the future of his daughter Kẹ́mi. He learned that she would marry a person with bad behaviors and suffer as a result of taking a wrong action. When beautiful Kẹ́mi grew up, her father counseled her so that she could make a right choice. However, Kẹ́mi refused to consider, Fágbàmílà, a well-behaved but very ugly man. Instead, she chose her classmate Ejò (snake), a metaphor for sugar-coated men who deceive women. After visiting the home of Ejò, Kẹ́mi discovers that Ejò’s home does not match his descriptions of it. She returned to her father’s home, and tendered her unreserved apology to him. The settings include Obatala’s palace, the home of Ejò, and the home of Fágbàmílà. Each setting shows an environment that is natural for each homeowner with images lending credence to the idea and quality of life associated with each character or owner. Ọbàtálá, the god, wears white clothing and has his staff of office. The crown on his head reflects his leadership role as a god. The image of Ọbàtálá wearing a beaded crown and that of his daughter first appear on the cover, each in the first letter that stands for the character. It is like watching a movie that shows the face of each main character before the real action follows. Inside the book, the drawings of a well-decorated palace show that Ọbàtálá was also a Yoruba king. Other images include buildings, roads, plants, insects, and other creatures. On the page where her father warned her to avoid deceitful people, one sees disabled people. Highlighting disabled people is important because the Yoruba associate the god Ọbàtálá with people with disabilities. The author has used a Yoruba chant, a narrative style that is common in Ifá and always filled with wisdom. This captivating style is also found in Yoruba folktales. There is also the injection of vital quotes such as “SEEK THOSE WHO ARE HONEST AND HAVE A POSITIVE ATTITUDE,” the warning that Ọbàtálá gave to mold his daughter’s character so that she would not go astray. The language in the book is simple, concise, pungent but blended with metaphors. For example, the snake is a metaphor for deceitful people whose lies will be detected no matter how long they mislead other people. The entire story is an analogy to illustrate the relationship that connects a deceitful person, the good mannered victim, possible advisor(s), and the fortune teller. The questions in the “Author’s Note,” test the reader’s understanding of the story. A correction is needed. The use of diacritic is lacking on the cover i.e., “Obatala” with the correct Ọbàtálá̱” on other pages. In sum, the book delves into the traditional Yoruba belief system and tells a story that is easy to follow. The moral lesson it conveys is universal. Parents all over the world want their children to walk in the right direction in life so they can be successful. The book does not just tell a fantastic folk tale; it reinforces the idea that children need to be obedient in order to succeed in their endeavors. It is highly recommended for people of all ages who want to learn about Yoruba culture and their world view about home training, character formation, and folk stories.